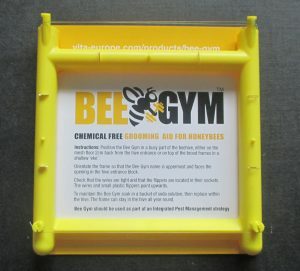 Visit www.vita-europe.com/beehealth/products/bee-gym for further information and a list of current stockists. Position the Bee Gym in a busy part of the colony, about 2 cms back from the hive entrance or on top of the brood frames in a shallow ‘eke’ or spacer. Use a sticky floor (coat a white piece of paper or cardboard with Vaseline) to observe mite drop. These should be refreshed regularly. 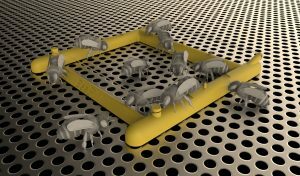 OR Use the Bee Gym with an open mesh floor so that the varroa mites drop out of jumping reach of the hive. Leave a 2 cm space between the hive entrance and the Bee Gym so that pollen-laden foragers are able to avoid the framework. Move the Bee Gym around the hive when convenient so that it stimulates more interest from the bees. 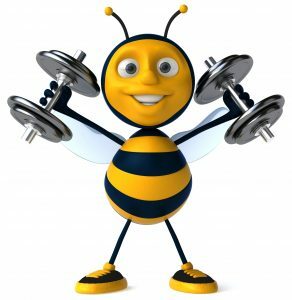 Leave the Bee Gym in place throughout the year as it improves grooming behaviour, helping bees to rid themselves of varroa mites. Ensure there is sufficient gap (at least 15 mm), for the Bee Gym to fit in under the brood frames and for the bees to have enough room on top. Clean the Bee Gym with washing soda periodically to remove excess propolis. Don’t worry if the bees propolise the frame a little – the grooming flippers and wires will not be affected. Vita’s honeybee health product range includes anti-varroa acaricides – Apistan® (outside the USA/Canada) and Apiguard® –chalkbrood and wax moth controls, foulbrood diagnostic kits and health-promoting feeds. Vita also supplies Asian hornet traps, Small Hive Beetle traps, the Bee Gym varroa grooming aid and swarm lures. Vita products have been registered by more than 60 veterinary authorities.